Emotional, devastating, healing, and magical. This book will bring all the feels. So go find a quiet place to read and react. From the prologue, I knew this was going to put my heart through the ringer. I was right. Good grief, did it hurt. So bad. But it was a healing hurt. I was sucked in a felt everything. I won’t tell you too much, you must just go into this blind. We met Dr. Noah Andelin in The Law of Moses. To be honest, it’s been so long since I read that, that I forgot who he was. But then it clicked and I was super happy to get his story. This book is about family. Family isn’t always blood. In fact the best type of family is the one you choose. Blood doesn’t matter. Only the heart does. Cora, Noah and Mercedes were the three Musketeers. No matter what happens in life, they will always be there for each other. Mercedes was the glue to her family. She would do everything and anything for them. Even stepping away from her true love, so her best friend could find happiness. She isn’t a martyr though. She genuinely wants everyone to be happy and is willing to do whatever it takes to accomplish that. I loved her. She was so real to me, that as I’m typing this out, I have tears in my eyes. The sacrifices she made for her family will shock you. But her heart is so big, she can’t help but to help. I love Noah. He could do anything as long as he knew his best friend was there for him. And let me tell you, life sure tested this. Him and Mercedes were always close, and this book shows that. From a young age, through life’s ups and downs, they were always there. And when life decided to toss them a few curveballs, they stood strong and held on tight. To have a friend like that is inspiring. I will say no more, except that you just need to read this. I don’t wanna say anything spoilerish, so I’ll leave you with this. 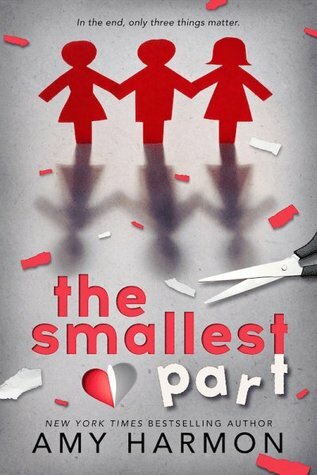 The Smallest Part is a story that will break your heart and mend it at the same time. Love can be found in the craziest of places if you only open your eyes, and heart, to it. You always know what to say to make a girl feel good. Thank you for the kind words! !